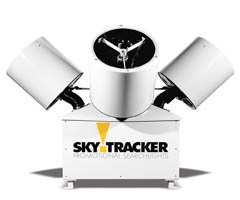 Purchase your Skytracker Promotional Searchlight Today! Single head lighting system for promotional or architectural use. 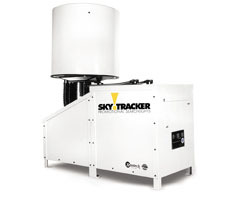 Light source is a xenon lamp, mounted in a 20 inch diameter reflector. The lamphead moves via a patented "bent shaft" movement. Ballast, motion system, and lamphead are mounted together. Included ammeter, automatic lamp ignition, hour meter, remote control/local switch (remote control requires additional electrical wiring), motion speed control and motion detection switch. Call for more information 1-800-733-8249. STX1-C-SERIES Same as the STX-B-SERIES, except interconnect wiring secified, but not supplied by Xenotech-Strong International Call Us! Four headed lighting system for promotional or architectural use. The system employs patented "bent shaft" movement of the four lampheads, resulting in a synchronous motion. Light sources are xenon lamps, mounted in 20 inch diameter reflectors. Ballasts, motion system, and lampheads are mounted together. Includes ammeter, automatic lamp ignition, hour meter, automatic cool-down circuit, and remote control/local switch. Call for more information 1-800-733-8249. * Denotes Standard Input Power, 380 VAC and 480 VAX are also available. Contact us for pricing.